HP Thermal Inkjet printing is going 3D, opening up new possibilities beyond existing technologies to enable a whole new vision for the future of 3D printing. We are embracing an open strategy for the development of HP Jet FusionTM technology. HP will publish the Jet Fusion APIs in the near future. For now, the Job Submission API documentation has been published here on the HP Developer Portal. Please note: This documentation is currently available internally only. Download the 3MF specification, view the Github project, get 3MF authoring and validation tools, and more. J. Scott Schiller, Worldwide Business Director for HP 3D Printing, gave an insightful keynote address at the TCT 3D Printing & Additive Manufacturing Conference in Birmingham, England, on Sept. 30, 2015. "The real opportunity is not about 3D printing or additive manufacturing. The major underlying megatrend is digitization. A digital transformation is going to work through the production and manufacturing of tangible objects. Given HP’s material science capabilities, one mindset might be that we should do this all ourselves, but we are embracing ‘open’ as a strategy holistically throughout. We need to collaborate. Whether it is the materials, or the software, fundamentally it is a philosophy that we will be embracing. We are making it so our systems will allow materials from third parties to work on our system as a platform." 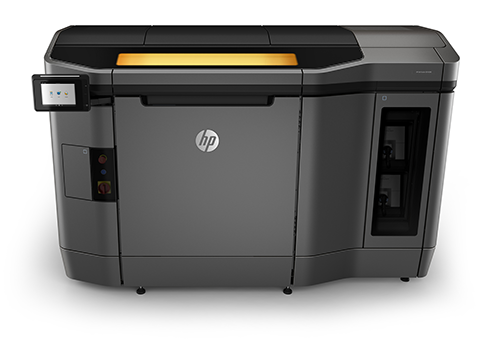 HP Jet FusionTM can produce parts significantly faster than any other 3D printing technology - but is it strong? Can a 4-ounce chain link made from fused powder lift an entire car? The hand-sized link was printed in less than 30 minutes. Steve Nigro is so confident about the link that he volunteers to lift a car owned by Jake, the engineer who designed and printed the link.